Lucid New York : Anna Sabino started Lucid New York jewelry collection as a transition from her glass blowing passion. She started working with metals and creating versatile, handmade jewelry for women like her, who are busy social butterflies and need to change fast from a work look to the night out look. I received the silver cupcake necklace from Lucid New York as a review. This adorable cupcake necklace $45.00 from Lucid New York Length is 16", charm is 1/2" long, is Sterling Silver and you are able to wear it with just about anything in your closet. I had tons of compliments about this necklace while wearing it out and about. This cute cupcake necklace is so fun and flirty any girl of any age will be able to pull this necklace off! the cupcake charm it's self is actually pretty heavy, I was not expecting that at all. The chain is a little bit more fragile then I would like it to be..only because I'm more clumsy and I'm worried it might break it . But the peep hole is big enough I will be able to find a new chain for it if that happens. The cupcake charm is sterling silver and it has great detail and the color is so crisp it shines bold when the light hits it. This necklace would be perfect for any kind of gift. ♥ I receive no monetary compensation for this review. 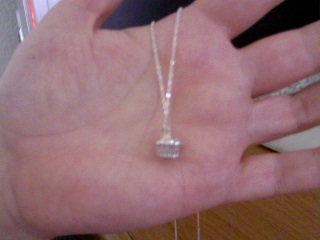 I was provided a cupcake necklace from Lucid New York to try and give my honest opinion.